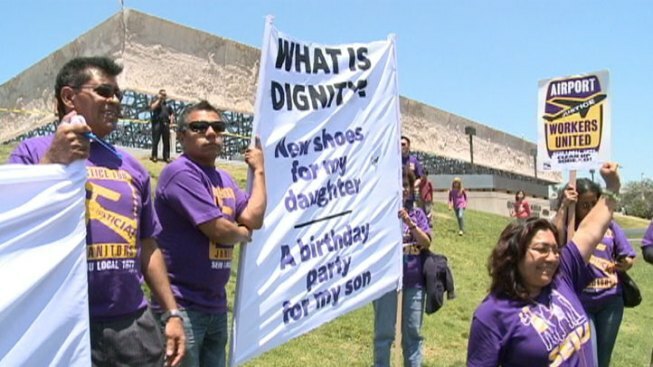 Janitors rally for better wages and dignity near the Los Angeles County Museum of Art. Nearly 1,000 janitors joined a rally for higher wages and a better quality of life near the Los Angeles County Art Museum Thursday. The rally was part of a commemoration of “Justice for Janitors,” a national movement started by the Service Employees International Union to fight for the rights and dignity of janitors across the U.S. and Canada. Janitors gathered around 12:00 p.m. at Wilshire Boulevard and Detroit Street. They looped around the museum and ended with a rally in the museum’s park area. The union hopes to call attention to the standards of living for middle class workers, many of whom can’t afford health care, according to Union organizer Mike Chavez . “The paid wages are so low that janitors struggle to meet the basic needs of their family,” Chavez said. Some long time workers earned as little as $312 per work after taxes, Chavez said. The original observance of “Justice for Janitors” began in 1990, following the clubbing by Los Angeles police officers of low-wage janitors protesting in Century City, according to the SEIU’s website. Cities around the country held similar rallies including Chicago, Seattle, and Dever.